Military: Defensive emplacements equal to a Cruiser Squadron. Five in-system Monitors. Vanguard Wing. Trade: All goods passing into or out of the Koronus Expanse. If it can be bought legally, it can be bought in Port Wander. If it can be bought illegally, it can probably be found somewhere aboard the station. Port Wander is rightly regarded as the last bastion of Imperial authority this side of the Koronus Expanse. It is a place of long shots and vain dreams, teeming with an ever-changing population of diplomats, hustlers, entrepreneurs, and wanderers. Among these millions of strangers move the functionaries of the Administratum, taxing every passage into or out of the Expanse based upon its perceived worth to the God-Emperor. All who pass into the Koronus Expanse, from the most pious to the blackest of hearts, share a single experience in that they pass through this vast station. 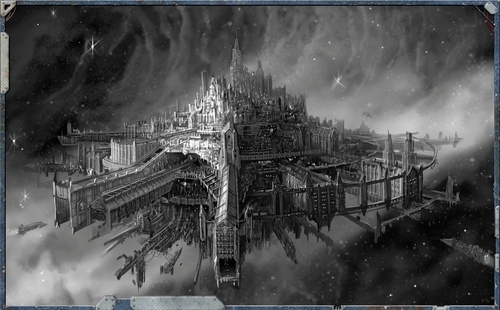 Founded in 917, M40 as a staging-ground to investigate the many vessels lost on the edge of the Drusus Marches, the void-station became vastly more important with the rediscovery of the Koronus Passage in the dying years of that millennium. Its role as a base for military operations has been long-forgotten and it has since become a way station for those seeking passage into the Expanse. From a distance, the port resembles a small cityscape, with spires and cathedral towers arching upwards and huge aquilae proclaiming its allegiance to the God-Emperor. At any given time there are at least half a dozen Rogue Traders docked at the station, as well as numerous other merchant vessels, bulk transports and smaller craft. Of late, convoys of mass conveyors and unwieldy transports have put into Port Wander, and there are always a couple of these vessels in dock - though the crew and passengers (if any) never disembark. No one knows where these vessels go when they vanish into the Koronus Passage, but rumours are rife.